Natural treatments for how to treat your acne at home. Natural Beauty Care offers some suggestions for natural ‘Do at home’ acne treatments. If your acne is mild or less severe, there are some natural and effective acne treatments that you can follow at home. How to treat acne, naturally. Finding an effective, natural treatment for acne can take a bit of homework. Especially when you are treating not just the breakouts, but the acne scarring too. Treating acne with Aloe Ferox herbal supplements and natural skincare products. Treating acne using skincare and herbal supplements from the Aloe Ferox range of products. They are specially formulated to help provide a natural remedy for acne and problem skin, using the healing power of Aloe Ferox. 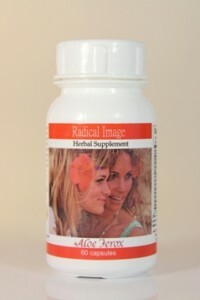 The herbal supplement Radical Image is helpful in terms of regulating hormonal levels and skin’s resulting oiliness. Skin scarring from acne is a common problem. Whether you are currently suffering from acne or had it some time ago, there is a good chance that you have some scarring imperfection you would like to remedy. Aloe Ferox Tissue Oil can be of great help in reducing the appearance of scars. Aloe Ferox offers natural skincare solutions for clear complexions. Aloe Ferox Facial Wash Bitter is a natural skin care product for the facial care and treatment of acne, spots and pimples. It contains Aloe Ferox bitter sap plant chemicals that are bacteria, virus and parasite unfriendly, helping to support the detoxification and disinfection of your skin. Aloe Ferox Bitter Aloe Gel with its aloe bitters works like a natural topical antibiotic and has pain-killing benefits as well as a combination of herbs known for effectiveness in dealing with skin problems. Alternative natural herbal treatments for acne. There are numerous herbs which are effective as a natural acne treatment. Try sage, sarsaparilla, yellow dock, burdock, basic, sandalwood or tea tree oil. Steep the herbs in hot water and apply the cooled infusion directly to affected areas. Neem is also effective in treating a variety of skin disorders. You can buy Neem in leaf powder form. Turmeric taken internally or applied as a paste to your skin is a good at-home treatment for acne – but do remember that it is staining and will add a yellow tinge to your skin that will require careful cleansing. So don’t try this before a big night out. Substitute regular tea for green tea which is considered to be helpful for cleansing your system. Fruit with high levels of acidity, applied directly to the skin is a great natural acne treatment. Choose from mango, pawpaw or grapefruit (avoiding lemon). Mash the fruit to a pulp and apply directly to your skin like a mask. You can add oatmeal or egg yolk if you wish. Leave on for 15 minutes and rinse well. A natural home-made toner suitable for acne can be made using cucumber juice, apple cider vinegar or tea tree distilled in mineral water. To help tighten pores after thoroughly cleansing your skin, rub an ice cube over your face before toning. Eating for a clearer skin. If your acne is mild or less severe, there are some natural and effective acne treatments by following a nutritious diet that you can follow at home. What you eat directly affects your skin health, and perhaps more so if you are suffering from regular outbreaks. Foods you should eat for a clearer skin contain high levels of vitamins A,B,C,D, E and Zinc, not forgetting the all important Omega-3. Vitamins that help beautify your complexion by feeding your skin are Vitamins A, B, C, D, E and Zinc. Acne aside, there are many natural ways to keep your skin in peak condition. Even if you are rigorous in following a healthy diet with balanced vitamins and minerals and have a scrupulous cleansing routine you may still have an occasional breakout. However, by adopting the very best and often natural acne treatments for your particular problem, your acne should clear and the longer-term problems of scarring will be greatly reduced. And, if you are relishing a clear complexion, that’s fabulous. But always keep a natural acne treatment on hand so that you can tackle any outbreaks from the first spot.